Okay, the show does have its "attractions." The “now” part is easy to explain. Pan Am is a sitcom on US television, currently in its first – and I suspect last – season. Although, I never did see eye-to-eye with US audiences, so I’ll probably be proved wrong and it’ll run for years. 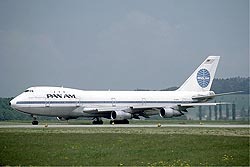 The show is based on the airline of the same name, Pan Am being short for Pan American World Airways. Sadly, the airline I knew, is no longer in existence. But the TV show has reminded me of that golden era of airline travel. When I mentioned this on Facebook, a friend kindly remarked that I “must be really old.” Yeah, I must be, because I did a lot of flying in the 1960s and 70s, and unlike today, I enjoyed all of it. Travelling in that era was a real pleasure, and I’m more than happy to be old enough to have experienced it. Why was it so special? Well, if you get a chance, watch the TV show and you’ll see that passengers were treated like VIPs, rather than cattle. What I like about the show is that it pretty-accurately depicts the whole flying experience of the 70s. Despite the fact that in those days I worked for BOAC/British Airways, Pan Am was one of my favorite carriers. I flew regularly between London and New York, sometimes making more than one trip in a week, and Pan Am was always kind enough to give me a First Class seat. The CEO of General Motors wouldn’t have had better treatment. The things I remember are the space, the food and the wines! Once the 747s were introduced in 1970, travel became even more luxurious and spacious. Rather than Business Class (which didn’t exist at the time) seating, the upstairs area was kitted-out as a bar/lounge, with sofas around the edges and a bar with real bar stools, rather than the normal rows of forward-facing seats. Going to the bar was optional, and maybe a little more than half the passengers would wander up the dozen-or-so stairs, leaving the main cabin quiet. A few passengers would “enjoy” themselves rather too much at the bar and would struggle to get back down the stairs safely for landing. The food had to be seen to be believed. There were far too many courses and far too many choices. When a stewardess (yes, we called them that in those days) asked “How would you like your prime rib sir?” if you answered “Rare” you could be sure you would get it rare, blood’n’all. “Would you like a little more sir?” always met with the obvious answer. Pan Am was not for slimmers. Wines. Did I mentioned wines? Okay, there wasn’t the choice of a Michelin three-star restaurant, but the quality was right up there. There was no way I could have ever afforded to drink the vintages that Pan Am served-up; and for that matter, still can’t. The rides into Manhattan were always a bit of a blur, not helped by the fact I often travelled with the Pan Am cabin crew, who always carried bottles of orange juice – that contained rather more left-over champagne than OJ! I doubt there were any partly-filled bottles left on the airplane. 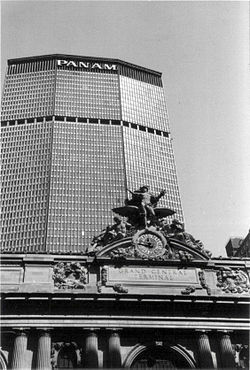 Although I was a regular visitor to the Pan Am building, the airline’s HQ at 200 Park Avenue in midtown Manhattan, I never managed to fly to or from the Helipad on the roof. That cut the journey time to JFK to just seven minutes. Unfortunately it did rather more than cut the journey time, as one day a helicopter was caught by a gust of wind and the whirling rotor blade of the toppling helicopter chopped-off a passenger’s head! But I did have an amazing helicopter flight one night when travelling from Newark to JFK airport to make a connecting flight from LAX. It was an amazing sight as the chopper flew not over the Manhattan skyscrapers, but between the buildings. Now though, those days are gone. I contrast the pleasure of flying in the seventies with the nightmare of the noughties. I vividly remember standing in Rome airport, being barked at to move away from the security area, having been practically strip-searched – shoes off, belt off, everything but basic clothing stuffed through the scanner, and wondering – how do I carry my shoes, belt and hand baggage, which needed both hands, without my pants falling down?